For those unfamiliar with the DC Super Hero Girls franchise the concept is that many classic DC comics characters are teenagers attending Super Hero High School, focusing on the female supers. Another neat twist is that villains aren’t villains yet, they might be morally flexible but they are still overall more good than bad. My eleven and seven year old daughters have been fans for several years now. They have watched the animated shows and movies, and read two of the chapter books, but only recently read any of the graphic novels. Finally having read this one, I regret not looking into them sooner. This book has a lot of fun antics but also has good messages about self esteem and mental health. Out of the Bottle starts with Wonder Woman (who uses the nickname Wondy), Supergirl, Katana, and Harley Quinn in art instructor, Ms. Moone’s art room working on writing and illustrating comics for a class project. Here is where the comic format is perfect to tell this story. You get to read each girl’s comic, complete with different art styles. Ms. Moone is ready to leave but the girls beseech her to be allowed to stay and finish their work. She consents with the stern warning to leave her magic potions alone. Harley feels frustrated that she can’t translate the vision in her head onto the paper. Disobeying instructions, she finds magic paint in the storage closet and uses it to try again. 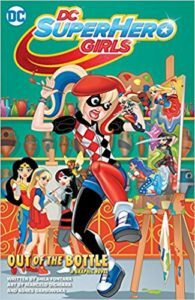 The magic paint brings the comic Harley Quinn to life, who immediately starts mischief by smearing the magic paint across all the girls’ comics bringing their characters to life too. Lacking humanity and thus the ability to feel empathy, the doppelgangers are evil by nature. Chaos ensues as the girls find themselves fighting against these alternate versions. Upon the discovery of this disaster, Principal Amanda Waller upbraids Ms. Moone. Rattled by the encounter, Ms. Moone’s calm composure is broken relinquishing control to Enchantress, her evil alter ego. All of Super Hero High becomes embroiled in the conflicts between comics brought to life and Enchantress. The resolution to the comic characters is creative and shows off Harley’s ingenuity but it is how she find the solution to getting Enchantress back under Ms. Moone’s control where she really shines by showing her intelligence and empathy. Harley reaches out to the smothered Ms. Moone, reminding her of the power of self esteem. That Enchantress being released was a self fulling prophecy because Ms. Moone didn’t believe herself strong enough to fully contain Enchantress. Harley shares a bit of wisdom from a poster in her therapist’s office. The stories we tell ourselves ’bout ourselves shape how we see ourselves. When we change the story, we change ourselves! At the reveal of Harley seeing a therapist, both Wonder Woman and Supergirl admit they see a therapist too. The girls share how important it is to take care of your mental health and that seeing someone carries no stigma because everyone needs help sometimes. There’s never any shame in asking a professional for advice and learning more about yourself. I was pleasantly surprised at the depth of story and important messages it conveys. Out of the Bottle has convinced me to get all the other DC Super Hero Girl graphic novels.